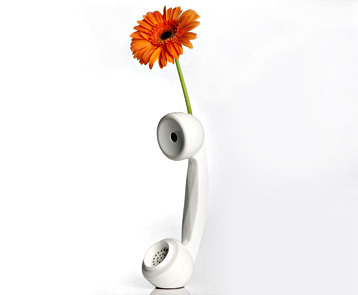 An outdated telephone handset (exception: still very much in use in India) recycled into a lovely single-flower vase. The vase is water sealed and cut on an angle. This Earth Day I want to share, communicate, say and salute quite a few things! And when I start posting with a plastic vase I do not just mean recycling. I want to say something else! Stay tuned and please keep coming back!! Do you think these products are beautiful!? Then let me tell you these are made from ughs…waste plastic – recycled plastic! And I think these are one of the most beautiful recycled plastic products I have ever seen! These are not just fun and funky products, these are functional too. How else I would say the bed cover, plastic rugs for swimming pool, computer bag and screens; some real recycled innovation!! These handmade products are from Kunye – brilliant brainchild of Alison Coutras (and her local team of craftisans – a cooperative to combat unemployment) in South Africa. Kunye is the Xhosa word for ‘forward together’. Kunye has won a number of awards.